New Moon: (beginning of an extroverted phase) new beginnings, setting intentions or projects and beginnings. She then waxes for approximately 14 days. During this period we work towards a point of Full Moon: completion of initiating phase, fulfillment, highlight, peak of this energy and a point from where to reflect and observe momentarily. She then starts waning (beginning of an introverted expression of the energy). Rounding up, completing and finishing off towards the point of the next New Moon which is in essence the end of the previous and the beginning of a new cycle. 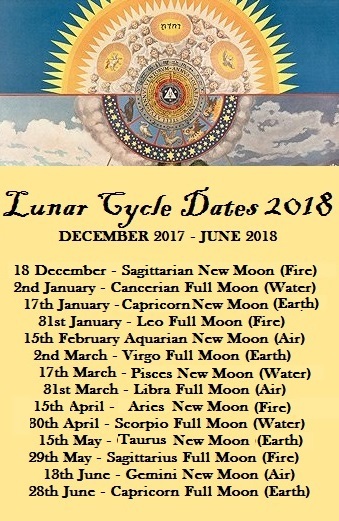 18th December (our actual ‘new year’ up and over the solstice date 20th December) – Sagittarius New Moon (Fire and Mutable). Expand your consciousness and world view by reading, travel, debate or philosophy. meditate on the bigger picture. Splash some paint on a canvas. Especially since it’s still a Mercury retrograde period – use the new intentions creatively and reflectively. 2nd January – Cancerian Full Moon (Water and Cardinal). Emotive, competitive, creative and protective, could be home based. 17th January – Capricorn New Moon (Earth and Cardinal). This is where the new year’s action and work begins. Practical application, get down to work, build, discipline, diligence, start new business or enterprise. Pragmatic work towards achieving. 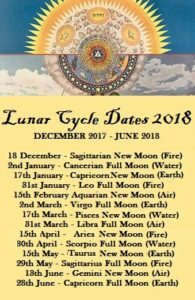 31st January – Leo Full Moon (Fire and Fixed). Expressive, leadership, creative, dramatic and displaying talents. 15th February – Aquarian New Moon (Air and Fixed). Friends, groups, media, social, sharing of information, ideas or research. 2nd March – Virgo Full Moon (Earth and Mutable). Pragmatic application, service, creating order, fine tuning skills and adapting. 17th March – Pisces New Moon (Water and Mutable). Imagination, dream, conjure up a picture, swim, show compassion, time for sensitive and emotive initiations. 31st March – Libra Full Moon (Air and Cardinal). The ‘other’, partnerships, communication, relational, alignment and balance.